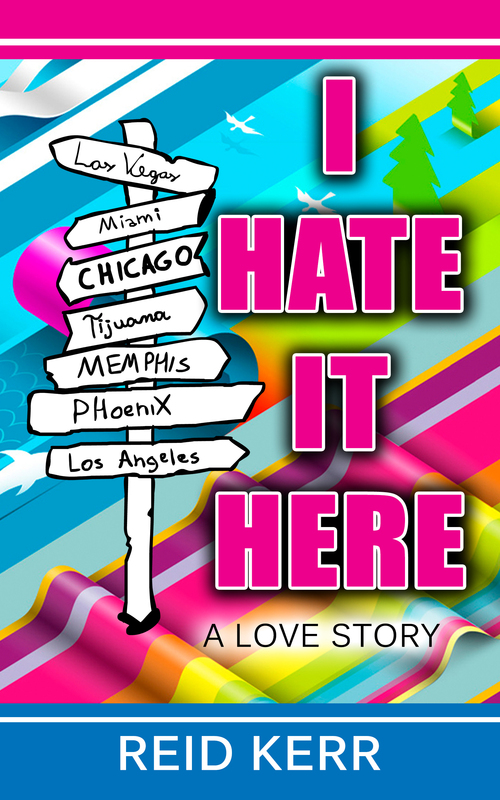 Reid's Newsletter: I Hate It Here cover(s), Sugartit, KY, and more! Inside this email: The cover of Reid's new book, plus the cover he loves but could never, ever use. (Click "Display images" in your email if they don't show up.) Plus the origins of "Sugartit." Check it out, folks. And thank you for subscribing to Reid's newsletter. Hey, look! It's Reid's newsletter. Finally. Greetings and salutations, amigos. Here's the first edition of my newsletter, which should have been out two weeks ago. As any editor who's ever worked with me can vouch for, deadlines aren't my strong suit. But anyway, here's goes. 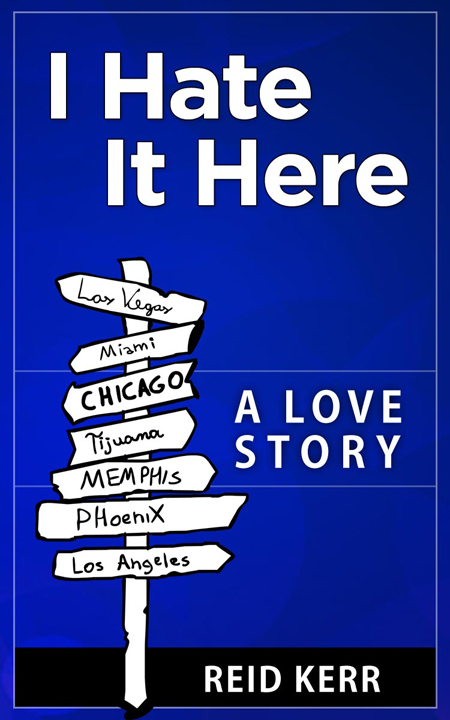 The new book, "I Hate It Here: A Love Story," will be out next Monday, August the first. It will make the perfect gift for friends, loved ones, enemies, jailhouse bribes, penpals, and total strangers. It's a collection of my tales from the road, so basically if you've ever clicked "like" on one of my Facebook statuses or a tweet, then you'll enjoy this book. There's no pre-order on it, so I'll make the announcement on Monday when everything goes live on Amazon.com. I hope you guys enjoy it, it's been a blast to write over the last four years. From "I Hate It Here: A Love Story"
Whenever I'm sitting at the very back of a plane, I assume First Class has their own stewardess, and their own in-flight announcements. Above, you'll see the cover for the book. I used a website where you can hire artists to do work for you, and since the prices there were pretty cheap, I had several artists do work on it to see what they came up with. Having spent a lifetime in radio, I'm just not a visual guy at all. 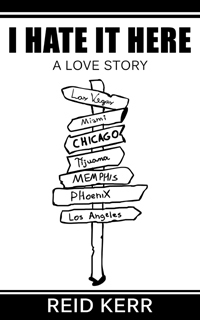 The original idea for the signpost design came from Lovely Wife Kimberly, which was perfect. After having one artist design the signpost, I had two others work on the cover. This one came in first, and really knocked it out of the park for me. I knew that was my cover, and went ahead and bought it. "Signpost off center, color background, title on top, name at bottom." I should probably point out here that this website features a lot of talented artists working on projects who are from all over the world, and language can become a barrier. The first cover this artist sent me was this one. As you can see, not much to it. It looks a lot like a box of generic corn flakes. There's nothing on this cover that would attract anyone's eye. Not even mine, and I wrote the &%$#@ thing. So I asked her for a revision. The main thing I wrote about was the absolute and utter lack of color. Again, I don't have any idea of what I want, really, I just know what I don't want. Which is sort of the definition of art, I guess. She responded back, and said she'd add some color to it. The next day, this arrived in my inbox. Holy crap, what a cover. When I asked her to use color, I think she thought I meant "All the colors, all the time." If you just catch it out of the corner of your eye, it appears to be moving. As Lovely Wife Kimberly said, "It look like a unicorn took a crap on it." Everytime I look at it, I see something else. There's carpet bumps in there. And clouds. And pine trees. And a dolphin, I think. Art is subjective, I know. And this could never ever be my book cover. This could never be any book cover, unless that book was about waking up from a drug-addled nap in the middle of a 1970's cartoon. But man, I loved it enough to buy it and tip generously, because this makes me laugh. Uproariously. Lesson learned: Just because something's not right, doesn't mean it's not funny. In which our hero shows that Kentucky is good at silly names, at least. Well, that’s a story, my friends. I moved from Texas to Kentucky a couple of years ago, originally to a town called Union. The easiest way to describe Union is that it’s nothing. The best way to describe Union is that it’s a suburb of a suburb. Union is a small area where people live on the outside of Florence, which is a suburb of Cincinnati. It’s like Heath is to Rockwall to Dallas. It’s a place where people moved away from the big city (Cincinnati) and moved so quickly, it spilled over into another tiny place that wasn’t nearly ready for that many people to suddenly move there. Living in Union was like living in a giant apartment complex. There aren’t many businesses, there’s not an industry, it isn’t a city, it’s just a place where people live. In ten years, it’ll be a giant suburb. Right now it’s just a place where people live who don’t want to live in Cincinnati, which is completely understandable. Union is a big town full of subdivisions which range from really nice to half-finished, and I lived at the lower end of that spectrum. My place was in a area full of barely-finished houses that have been sold multiple times, or are now for rent. When I look out my back porch I see houses with first-floor walkouts above basements, but they’ve never gone to the trouble to put in an outside deck or porch. It’s just houses with walkouts to nowhere, like if you were in their kitchen and threw open the sliding glass door, you could walk straight out and kill yourself. Which is a viable option in Kentucky, it seems. One night, a friend of mine was posting a Facebook status from her couch. The location came up “Sugartit,” which we all found hilarious. I looked into it, and sure enough, “Sugartit” was a location in Kentucky. It’s a ghost town in Boone County. And apparently, that location was somewhere close to my friend’s couch. And so, I decided to claim Sugartit as my own. I became the mayor of Sugartit. I founded the Sugartit Machete Club. I post about it on Facebook, and people find it hilarious, and think I’m joking. And I'm not, and that's the funniest thing to me. I figured if I have to live in this Northern Kentucky sinkhole, I should at least make it funny. And better yet? “Sugartit” is just one hilarious location in my county. There’s also “Beaverlick,” and a state park named “Big Bone Lick Park.” It’s like Kentucky people realized their state wasn’t going to be very interesting, and still be using heroin and not having access to the internet even into the mid-2010’s, and decided to make up for it with funny names. Thanks for following me online! As always, tell your friends, but only if they'll get my jokes. Here's to life, my friends. Copyright © 2016 Reid Kerr, All rights reserved. 2742 Coachlight Lane, Burlington, KY 41005.